A row house on s. Ruby St. in west Philadelphia will be demolished after collapsing early Wednesday morning July 26, 2017. Two people escaped serious injury early Wednesday when a side of their standalone rowhouse in West Philadelphia collapsed, spilling out it contents in a cascade of bricks and belongings. Firefighters were called to the house on the unit block of South Ruby Street about 4:45 a.m. and found two residents, described as a couple in their 40s, who were shaken but otherwise unharmed after getting out of the house. NBC10 reported that passersby heard the woman's cries and helped the couple get out of the rubble. 6ABC reported that the woman said she heard creaking and the man said the couple's cat started acting funny right before the collapse. The cat was missing Wednesday morning. The house had once been part of a row but the units that had been on each side no longer remain. More of the building collapsed after sunrise. The mural that had been on the wall, "I Want to Call You Names," was part of the "Love Letters for You" series of 50 murals along Market Street in West Philadelphia. 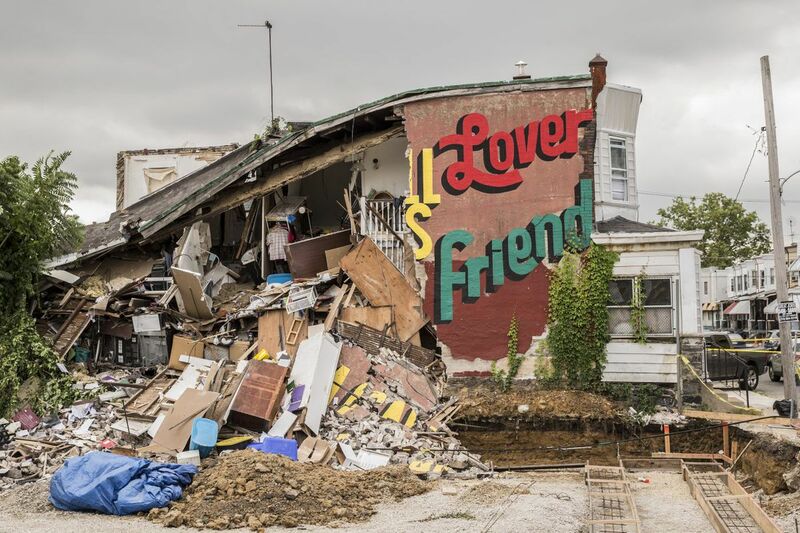 “I Want To Call You Names” mural was part of the “Love Letters to You” series along Market Street in West Philadelphia until the wall collapsed on July 26, 2017.